A friend gave us a few plants a couple of years ago, but not a store-bought variety. His property is next to the Juniata River and one of his favorite past times is to go down to the river and see what he can find. Sometimes he’ll come back up the hill with buckets of minnows or baby catfish that would then be raised in fish tanks. River rock and driftwood are common finds and so are plastic chairs and other sundry items that get washed downstream during heavy rains. Once in a while he’ll venture far enough to dig up flowering plants that he usually transplants near his goldfish pond. 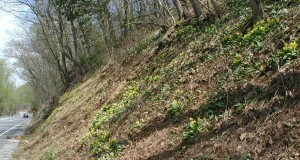 We were lucky to receive these beautiful yellow flags or yellow irises. 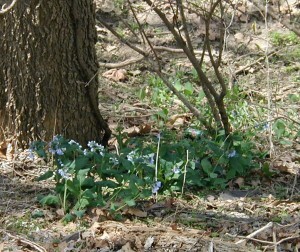 The plants get about three feet tall, but many of the sword like leaves arch over to a foot or two tall. From year to year the iris plants get bigger and this year they flowered the most in their three years here on the mountain ridge. I think last year each plant had one flower stalk with 1 – 3 blooms. 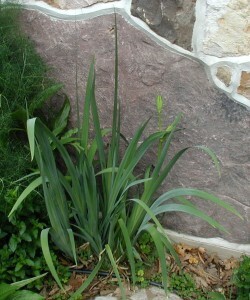 This year there are five flower stalks among two clumps of iris planted in different areas. 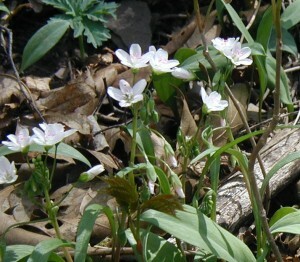 Each flower stalk had 1-5 flowers. 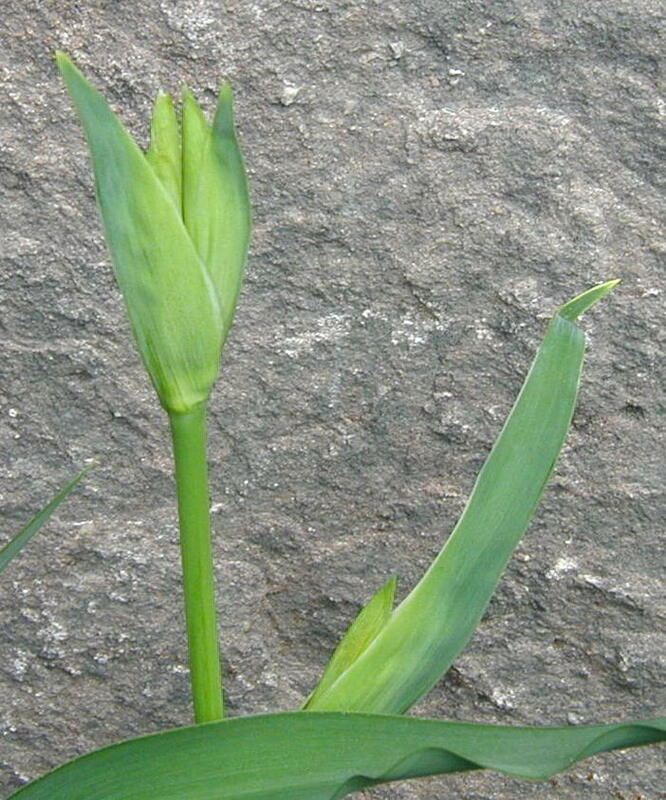 Yellow iris foliage and flower buds. 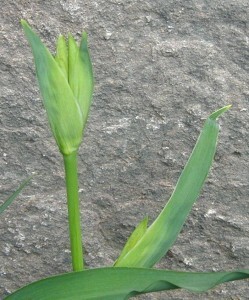 Three flower buds of the yellow flag or yellow iris. 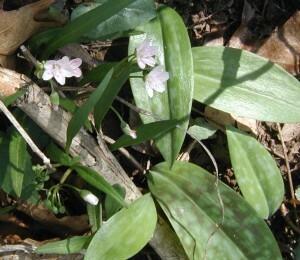 Three flower buds are apparent in the images above. Photos taken 2 May 2010. 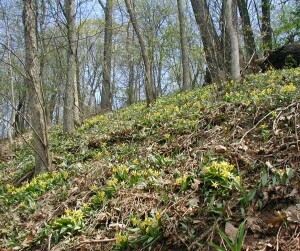 Beardless yellow iris flowers. Photo taken 7 May 2010. 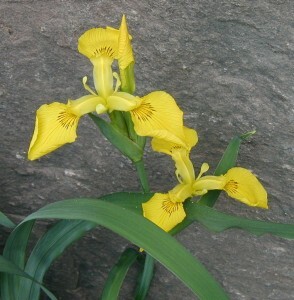 The yellow flag is typical of Iris species, where the large yellow “petals” that are veined with purple and that arch downward are really the sepals. Smaller upward pointing petals are the true petals. 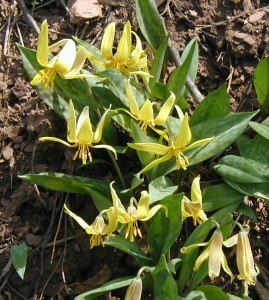 Inside to the petals are three styles, which look like smaller erect petals. 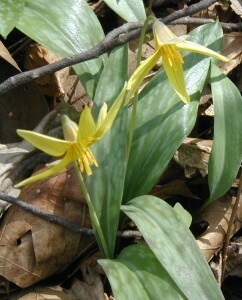 The yellow flag has purple lines on the large bright yellow sepals and a lighter yellow color on the other flower parts. Even though the yellow flags, that were found down by the river, seemed to be a natural plant there, the Iris pseudacorus is not native to the United States. 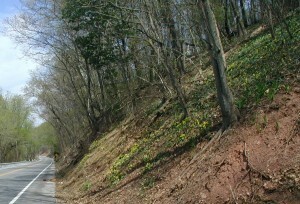 Yellow irises are native to Europe and the specimens that we find along rivers and creeks are garden escapees. 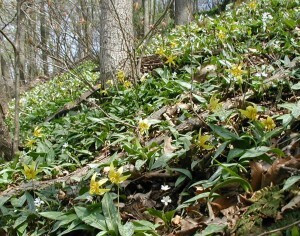 We could also say the yellow flags are naturalized to our area in South-central PA. Somehow it feels good to have re-captured a wayside plant. We can enjoy its beautiful yellow blossoms and sword like foliage whenever we’re outside the house. 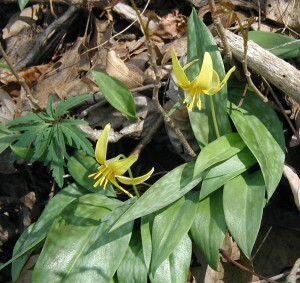 There is no indication in Peterson’s Edible Plant Guide or Peterson’s Medical Plants Guide that the yellow flag has any edible or medicinal value. Beyond its appeal as a garden member, its long linear leaves could be used to make small baskets for collecting berries and cones. 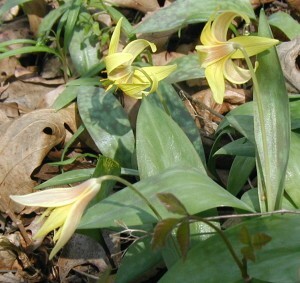 The leaves also lend themselves as natural additions to cut flower arrangements. 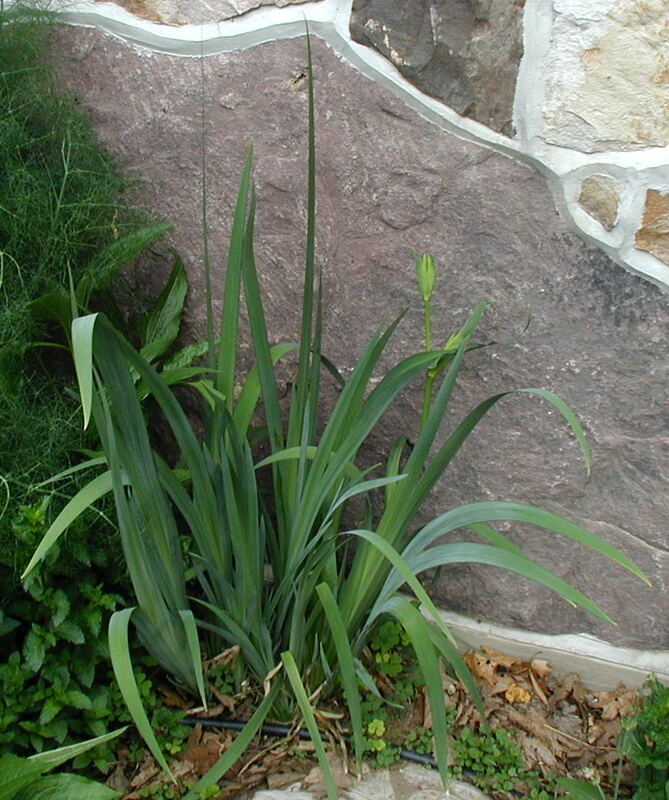 In the autumn the iris plants can be separated into individual fans and re-planted. Use a sharp spade to slice through the roots in between the small groups or fans of leaves. Or, dig up the entire plant and use a sharp knife or shovel to separate the fans, roots and all. Transplant to new area, water and mulch. Look forward to next year’s blooms!